November 8, 2018 – Pobjoy Mint has released the final coin of the popular set of five coins featuring the five breeds of penguin that are resident on the Falkland Islands at some point during the course of the year. With over 1 million penguins nesting of the Islands, it is no wonder that the Falkland Islands is known as the penguin capital of the world! 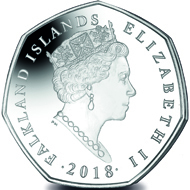 Falkland Islands / 50 pence / cupro nickel / 8 g / 27.3 mm / Mintage: 7,500. 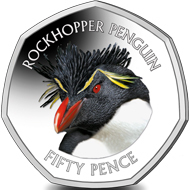 This new series of coins features close-up head shots of the five penguins that inhabit the Falkland Islands, each shown in glorious colour to enhance the detail. Pobjoy is also producing a new collector’s album to hold the set which sets the coins against a beautiful image of a group of King penguins and includes information on each breed. 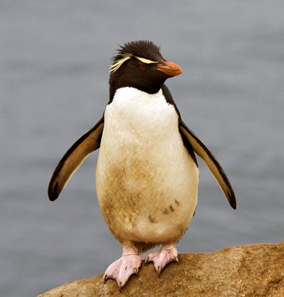 The Southern Rockhopper Penguin is endemic to subantarctic waters. Photo: Samuel Blanc / CC BY-SA 3.0. More information about this coin and other issues of the penguin series is available on the Pobjoy Mint website. This short video clip by PBS provides some additional facts about the Southern Rockhopper Penguins. The National Geographic has also published an article on the Southern Rockhopper Penguin.